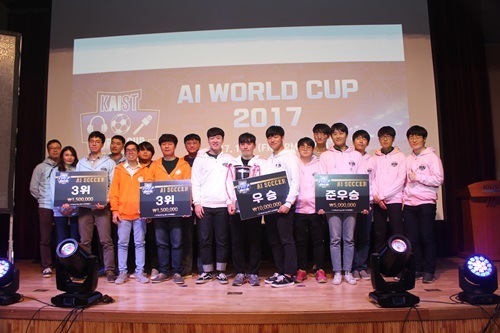 The final round of the AI World Cup 2017 was held at KAIST on December 1. AI soccer players, with limitless stamina, run about on the virtual field. The diverse strategies get the crowd cheering and chanting. There is a chorus of groans when the ball misses the goal post by an inch. This is no different from the FIFA World Cup. The first-ever AI World Cup 2017 was held at the KI Building on December 1. The building was soon filled by a large crowd, eager to watch the event. Each team consists of five AI soccer players trained with Q-Learning and other AI technology. The competition categories included soccer, AI commentator, and AI reporter. A total of 26 teams from universities, research institutes, and companies participated in the AI World Cup. Eighteen teams entered the World Cup, and four teams each took part in the AI commentator and the AI reporter categories, respectively. AI commentators were judged based on their accuracy, faithfulness, predictability, and fluency, while AI reporters were evaluated based on their structure, readability, authenticity, information, and similarity to human reporters. One player is sent off the field when three or more defenders are in the penalty area. Players cannot be replaced, and the score is reset when the ball remains stationary for more than a few seconds. 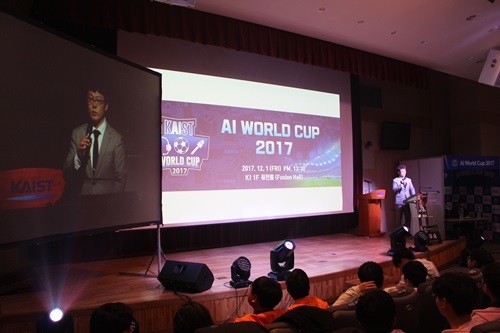 The final round of the AI World Cup 2017 began with an energetic opening by KAIST student commentators. KAIST’s WISRL and Chonbuk National University’s AR LAB compete in the finals. The final round was presented on a large screen. The spectators had to concentrate to keep up with the pace of the AI soccer players. The room was filled with cheers whenever a goal was scored. The student commentators added to the atmosphere with their wit and humor. Similar to AlphaGo, the AI players who participated in the World Cup are capable of learning on their own. They dribbled the ball in unconventional directions and played for time when in disadvantageous situations. On the other hand, there were also times when the players gathered in one place and stopped moving. 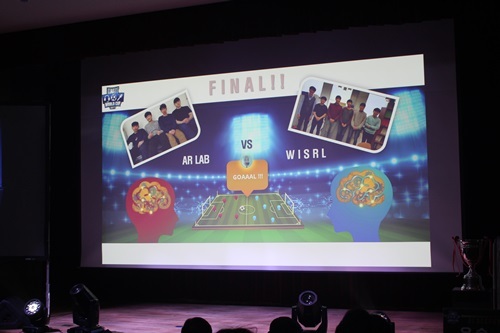 After beating off stiff competition, KAIST’s FC WISRL and Chonbuk National University’s AR LAB made it to the final round. The commentators expected the final match to be a clash of spears and armor, with AR Lab’s strong offense and FC WISRL's good defense. Contrary to expectations, the AR Lab team led by 5 points in just 20 seconds from the start of the match. The students from Chonbuk National University became the champion of the first-ever AI World Cup, beating KAIST with a score of 13 to 6. The World Cup awards ceremony was followed by the awards ceremony for AI commentators and AI reporters. The winning team received a certificate, trophy, and KRW 10 million as prize money, while the runner-up received KRW 5 million. The two teams that fell in third place were awarded KRW 1.5 million each. Yally and KAIST DeepCMT won the participation prize in the AI commentator and AI reporter categories, respectively. Yally was prompt in assessing the flow of the games and delivered an intelligent commentary. KAIST DeepCMT gave an accurate overview and made useful suggestions for weaker teams. Dongsoo Har, the head of the organizing committee said, “Based on this year’s success, we will expand the AI World Cup into an international event next July.” The international AI World Cup is scheduled for July 2018. Group photo of winning teams.